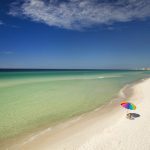 If you’re anything like us, when it’s time to clear aside the winter boots and pack up the snow suits, all becomes right with the world again. 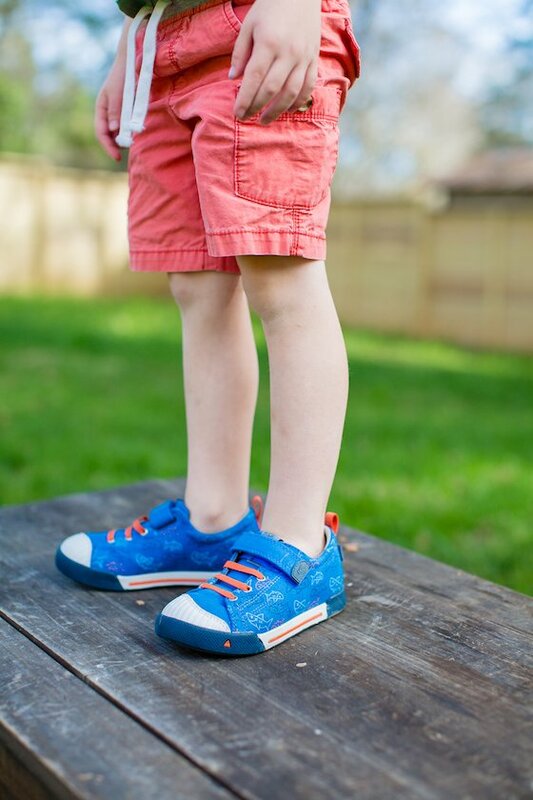 Spring has sprung, and so have our kid’s shoe sizes. With a new season comes new trips to the store to bring a little color and spirit back to wardrobes and shoe racks. You know your kids are almost as excited as you are to be outside again, running through the grass, hiking through the woods, and riding bikes until dinner time. 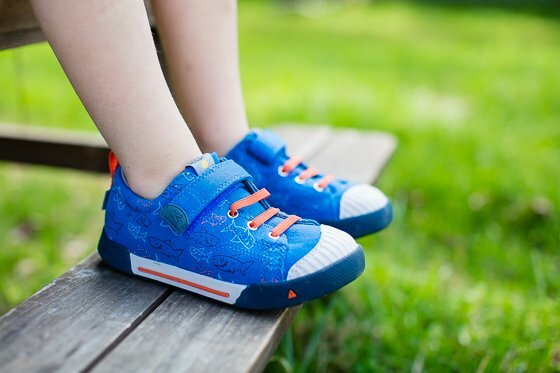 Be sure when you’re choosing their shoes this spring that you don’t just opt for the cutest pairs, but also the most durable, because your littles are going to be hitting the ground hard. 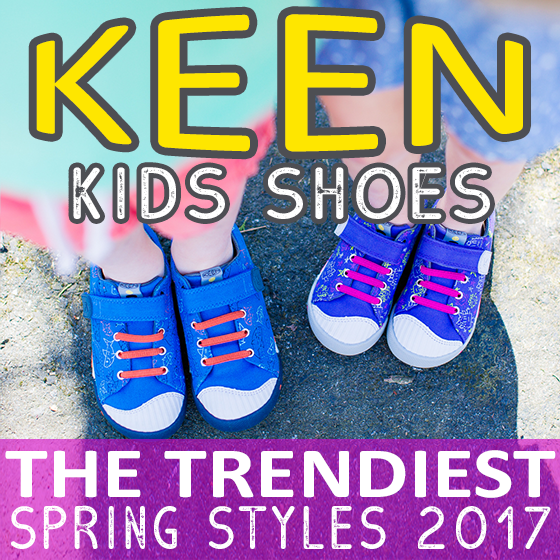 Stock them up with KEEN Kid’s new spring styles, and you can enjoy the best of all shoe worlds, fashion and function, all rolled into a pair of shoes that will far outlast their growing feet. 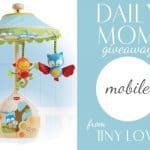 We at Daily Mom are KEEN fans all the way. 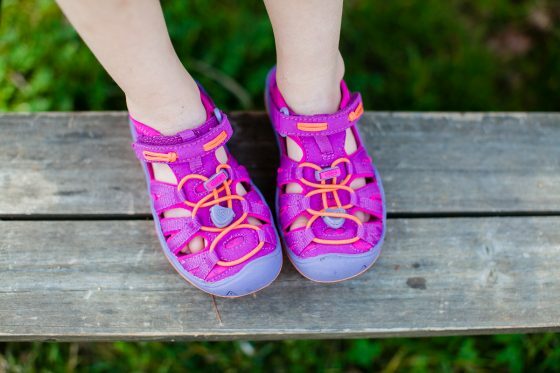 From their adult footwear down to their itty bitty shoes for brand new babies, from their summer shoes made out of bungee cords  say wha!  to their ultra tough steel toed work boots, we love it all. 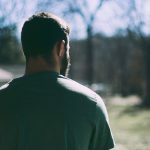 They are headquartered in Portland, Oregon and currently produce more than 20 styles in their Portland factory, using the best materials from around the world, with a goal to keep expanding production here in the US, keeping with the American spirit of supporting and loving on our economy. Being born from Portland back in 2003 gives KEEN a one up, as they are immersed in the outdoorsy lifestyle, surrounded by all things hiking, active, and natural, which allows them to see firsthand what needs their customers require in the shoes they wear. This in turn inspires them to create top quality items with innovative features that are above and beyond other brands. 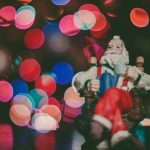 While KEEN does shoes in a great way, they also have other passions, including trying to make this world a more awesome place to live and play and helping those who need a little love and inspiration. Some of their programs they run are The KEEN Effect, Live Monumental, and partnerships with non-profit organizations. Girls are always on the move, sometimes more than boys, so the stereotypical dainty sandals and flimsy flats just won’t do for everyday wear, especially when warm weather strikes and outside is the place to be. 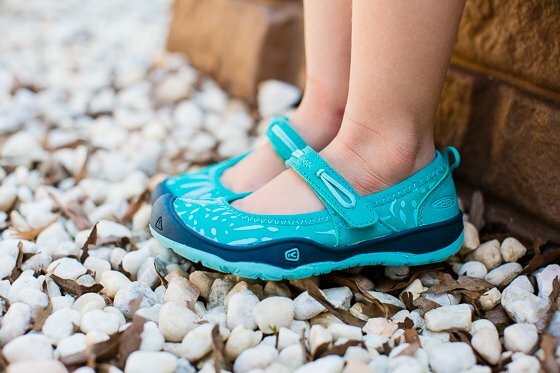 KEEN Kid’s knows that, so their spring line for girls features durable, comfortable, and flexible shoes that are safe for creek hopping and monkey bar landings. But, just because a shoe is made for rough-and-tough gals doesn’t mean it can’t also be stylish, so go ahead and take a look at these pairs, and we dare you to tell us that they don’t perfectly mesh function and fashion. The new Encanto Finley is a sneaker that is bold and sassy, with a perfectly classic, low-top design. 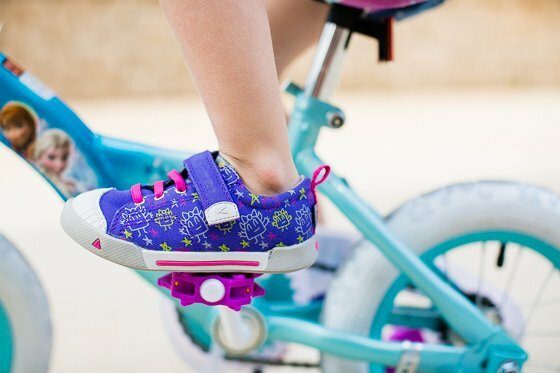 Featuring lightweight canvas uppers and a non-marking rubber sole, a breathable mesh lining with Cleansport NXT for odor control, and an EVA footbed, this shoe is fun and funky for girls with big personalities. 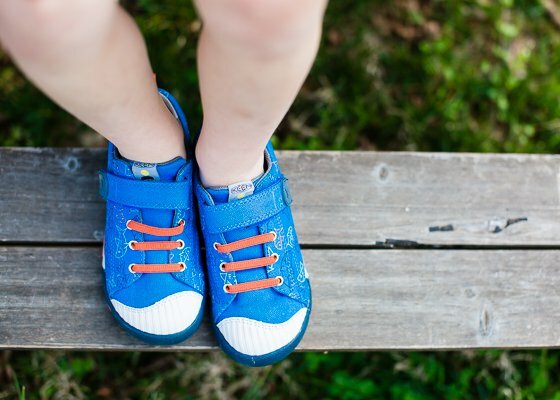 The contrasting elastic laces are for show only, making the hook and loop strap child-friendly for independence. Your gal can choose from polka dots or monsters, and no worries for when brother side eyes his sister’s new kicks, they have boy options in this style as well. 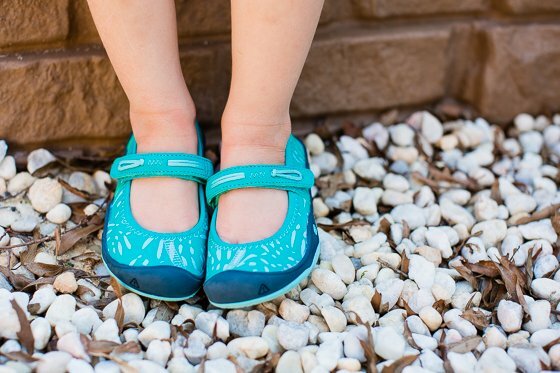 Moxie is KEEN Kid’s new spring line for girls only, and it’s beyond adorable, featuring three different styles (two are covered in this post). 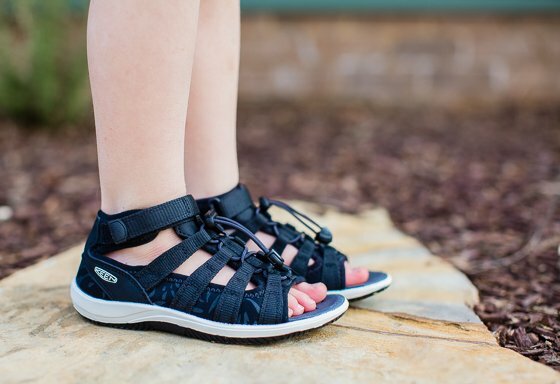 The Moxie Mary Jane has to be one of our favorites, because we secretly wish we were size 9 in toddler. Inspired from the classic Mary Jane design, but given an outdoorsy and ultra durable vibe, this sandal comfortably slips on the foot and stays put with the hook and loop strap. 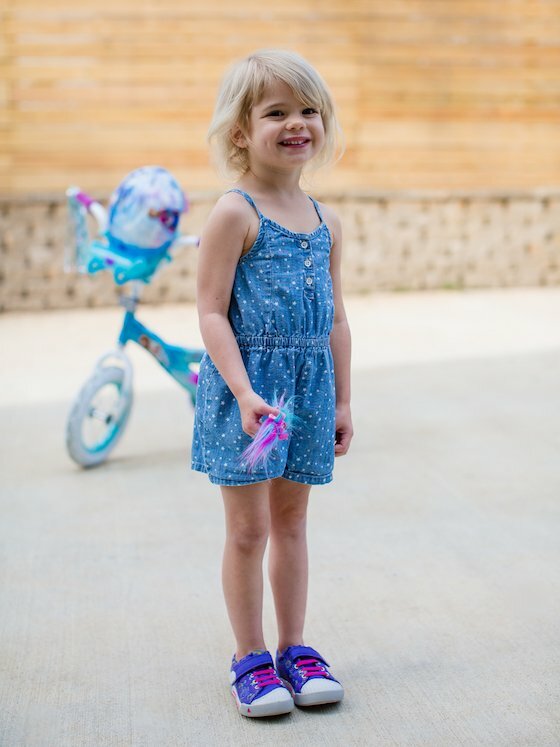 A cushioned, removable EVA footbed, chunky rubber sole, and reinforced toe will keep your daughter’s feet well protected, while still allowing her to feel feminine. 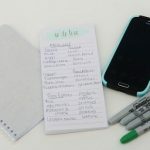 Choose from a selection of bright, fun colors, all made with quick-drying materials that are easy to keep clean. 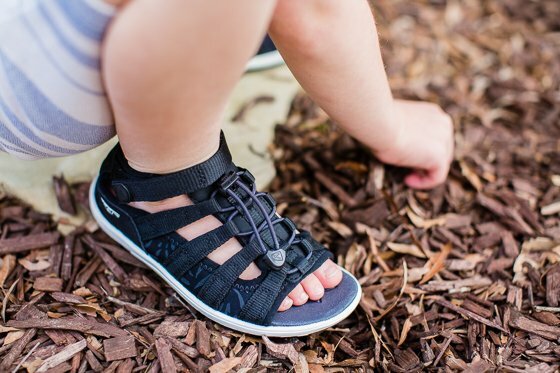 For the ultimate adventure making shoe, the Moxie Sandal gives girls everything they need to go off the beaten track and explore their hearts out, while staying upright in a comfy and chic way. The metatomical, cushioned EVA footbed and covered toe protect the feet, while the cut out designs and breathable jersey lining let air pass through, even on the warmest of days. 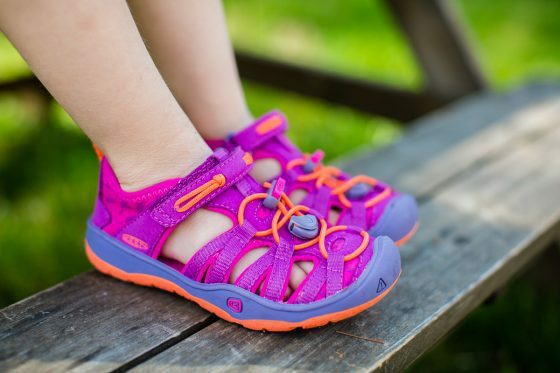 Featuring KEEN Kid’s signature fit lace capture system – that is easy and entertaining for kids – and hook and loop strap for an even more secure fit, this sandal isn’t going anywhere, even when your gal does. 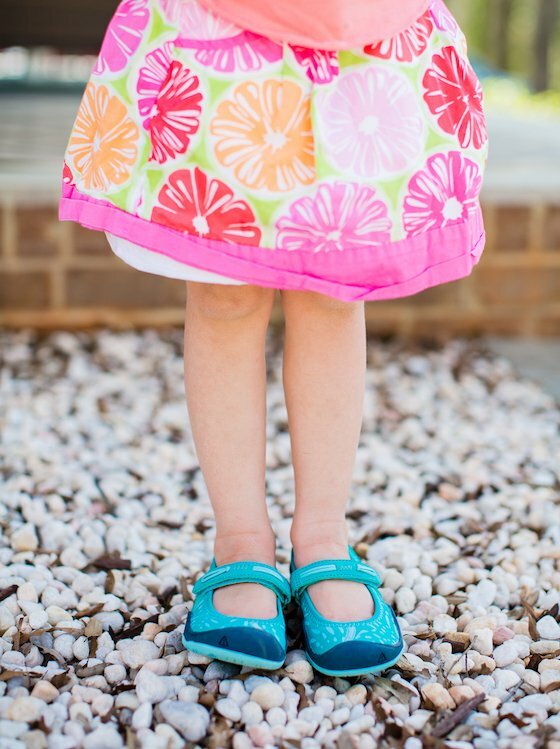 Have your daughter choose her favorite color combination for a sandal that will last her all spring and summer long. 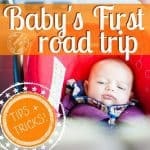 Any parent who has boys knows that everything from their clothing to toys to shoes take a beating, everyday, all day. When the sun and the neighborhood gang is out, there’s no telling what mischief will go down. While you’re always grateful when your guy comes back without a broken bone or a busted lip, you do always glance downwards to see the damage that he did to his shoes that afternoon. A boy’s endurance is tough, but his shoes have to be tougher to keep up. 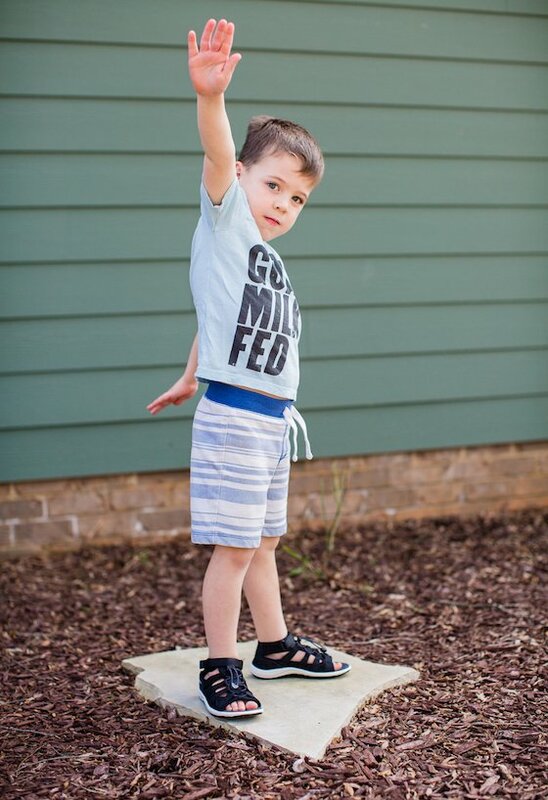 That’s why every boy should be rocking KEEN Kid’s during the warm, active months. Here’s what they came out with this season for the rough and tumble gents. The Encanto Finley is just so good of a shoe, that they couldn’t limit it to one gender. Both boys and girls can rock this everyday sneaker that we talked about above. Boys get a choice of swimming sharks or monsters to go with them on their adventures. Let’s face it, one sneaker just isn’t enough for a dude’s shoe rack; not because of fashion – unless he falls under the style influence of his metrosexual dad – but because he runs too much for one shoe to keep up. Even though a KEEN Kid’s sneaker can go the extra mile, having a backup pair is always smart parenting. That’s why the new Encanto Wesley Low is the perfect option. 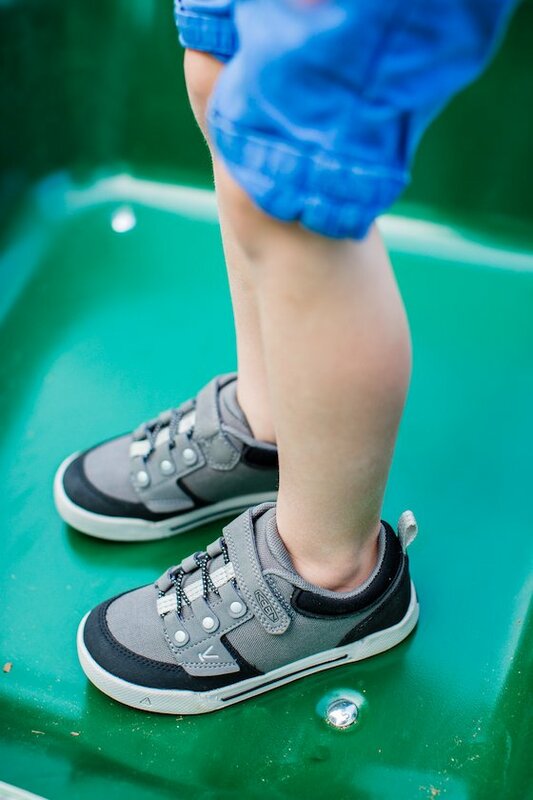 Made just for boys who love to move, this low top shoe, with its soft padded and reinforced ankles, tongue, and collar, and rubber sole is a sporty design that will keep your son safe and stylish during all his boyish activities. 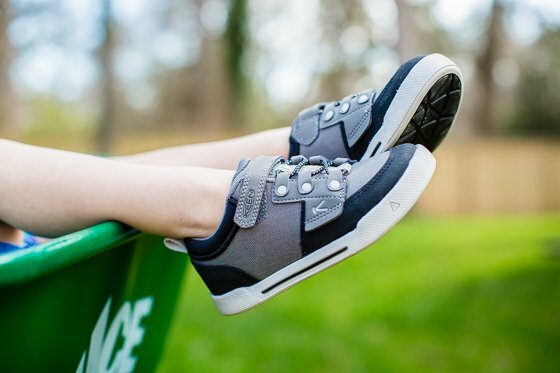 Cleansport NXT for natural odor control, a breathable mesh lining, and an easy hook and loop closure will make this sneaker a winner and go-to pick for your little guy. In two neutral color choices, your only decision will be what sport to sign him up for this season. For days when socks just aren’t an option and those little toes want to breathe, break out the gender-neutral Hadley sandals. With an open toe design and bungee cord and hook and loop closures, this sandal is easy to slip on and off. The sporty, non marking rubber sole makes it easy to play hard, while still being safe, and the breathable jersey lining with Cleansport NXT helps keep stinky feet at bay. Take your pick of color options, even though we are partial to black, making this one sandal that you can pass down to siblings. Yes, we really said there’s a shoe that is pass-down-able! 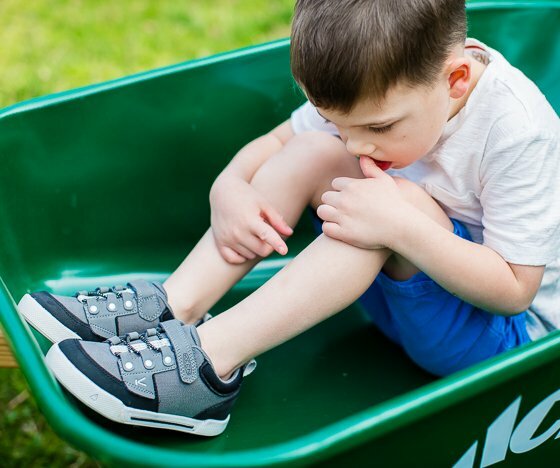 You can easily cross shoe shopping off your spring cleaning list now, and be assured that both you and your kiddos will be happy with this season’s choices. Now, get out there, get moving, and enjoy spring! KEEN shoes belong at a campsite, and so does your whole family! 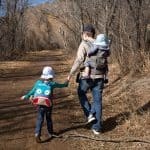 Bring the KEENS along, and find out what else you need to make your spring camping trip this year the best one yet: The Ultimate Family-Friendly Camping Gear Guide.